There is beer in this recipe. I want to put that out there up front so those sweet, apple pie stay at home mom’s out there reading this don’t get all the way to the grocery store before realizing that there is—oh no not that!—beer on the ingredients list. I’m sure you can substitute chicken broth to make this more kid friendly, but for those of you adults who just don’t normally drink beer I challenge you to be bold—just trust the recipe. You don’t really taste the beer outright, but I think it adds something to the flavor that really makes it complex and delicious (and it smells amazing!). And of course the chicken breasts, cooked in the crockpot for several hours, are as always fall apart tender and moist. It’s always, hands down, the best way to cook chicken. In fact, at the end of this recipe you are supposed to remove the cooked chicken breasts, place them in a bowl, and shred. Well I tried to stick them in the middle with a fork and lift them out and they literally fell apart. It was beautiful. The best kind of cooking failure, when you can’t shred your chicken in a bowl as the recipe calls for because it shreds itself. And wonderful, moist chicken aside, this was just delicious. It definitely climbs to the top of my slow cooker recipes. It’s cheap and simple and makes SO much food. My husband and I literally have been eating it for a week, which is okay with us because its delicious and reheats like a dream. 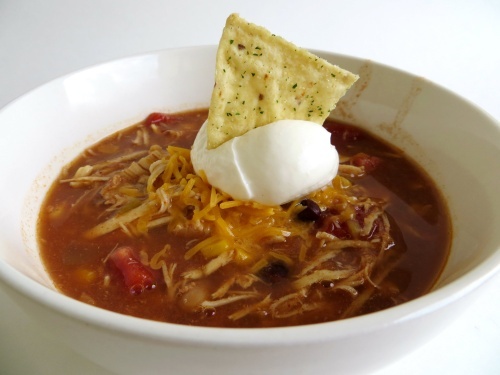 Add a dollop of sour cream and tortilla chips–crunched or used to scoop–and you’ll be set. I’d recommend this recipe for when you’re having people over for a quick and easy solution. And if you’re going to tortilla chips anyway, do it right and get the ‘hint of lime’ chips. So delicious. Author Kyra KetnickPosted on June 11, 2012 February 1, 2019 Categories chicken, dinner, slow cooker1 Comment on what rhymes with tortilla? Lasagna is quite a varying food. There is the frozen kind (“homemade”), the basic ricotta-and-marinara-from-a-jar lay up, the extreme homemade-noodles-sauce-and-expensive-cheeses, and then variations in between (see my white mushroom lasagna and then make it and die happy). This recipe is from the all hailed Pioneer Woman, and you can bet anything out of her kitchen is going to be good. This recipe is so unique in that it is one of the most hearty, robust, flavorful lasagnas I have ever tasted—the kind that makes you want to hide away on the couch with a bowl full and watch the snow come down (says the Floridian-ha!). It comes across as a complex recipe that I would never make on my own because its too much work. BUT the amazing thing is that this recipe uses every short cut and canned item it can, much to the dismay of many food snobs. 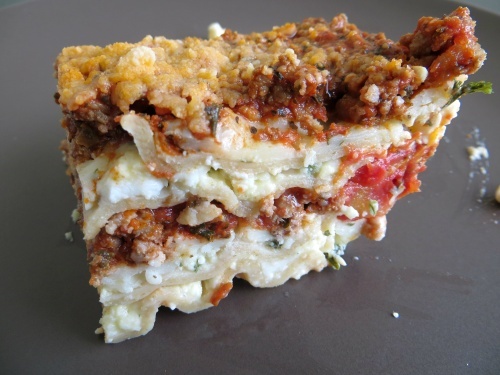 But all the reviews speak loud—all the chefs were skeptical, even wagged a finger or two but admitted in the end that it is truly a spectacular lasagna. And THAT is my kind of lasagna (also it filled my 9×13 dangerously to the brim so it will feed a lot of people or last for quite a few meals). 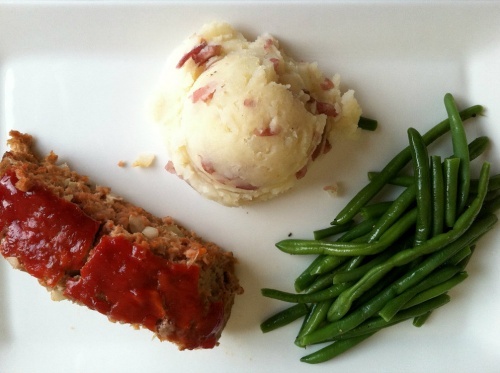 Author Kyra KetnickPosted on June 6, 2012 February 1, 2019 Categories beef, dinner, pastaLeave a comment on robust, a must! This was a product of the all-too-often post work dinner scramble. I I have a ridiculously tall stack of Real Simple magazines that have boundless recipes tucked into their pages and I rarely take the time to dig through them use them so so much….yeah. So I decided to dive in and found this little gem in their little section where they list “10 ideas for”—this time was ground turkey. The main appeal was that recipe was succinctly summarized in a mere 3 or 4 sentences, ingredients and all. I knew it’d be quick and was surprised by the impressive taste. It’s not the biggest loaf, serving 4-6 people with sides. But it’s just what I needed in a tight fix and and was too simply delicious to be true–and wallet friendly. Whip up some homemade mashed potatoes (if you have the time—they will beat the pants off of instant every time!) and a veggie and enjoy a great, healthy dinner. I was raised on ‘I Love Lucy’. I remember rummaging through row upon row of VHS tapes, reading the backs to see which one held the 3 episodes I desperately needed to watch right away. Lucy getting into mischief, Ricky finding out and furiously shouting at Lucy, Lucy doing her classic diagonally slanted moan as she realizes she’s in trouble…..and the classic kiss-and-makeup ending. At the hub at this Lucy frenzy is my mother, who’s recent 50th birthday party prompted the purchasing of the entire I Love Lucy series on DVD, which takes up the space of a cereal box. 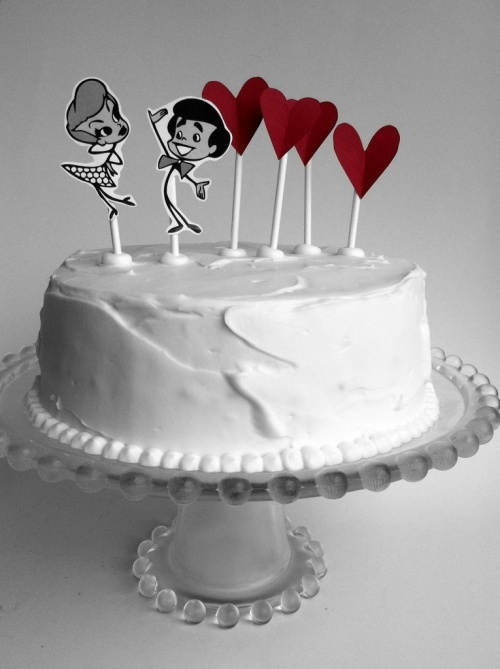 That box of VHS tapes is still in my mom’s garage in case nostalgia kicks in and we have to watch it the good old fashioned way, the same way this cake was a nostalgic nod to so many years spent cuddled up on the couch, talking and laughing with Lucy. And what other way to celebrate my mom’s love for Lucy, the famous carrot top, than with a classic carrot cake. I searched for a cake that would cut clean and not crumble, something with a bright flavor (thank you orange juice and golden raisins) and some depth to it (ginger steps up to the plate!). And I’ve had this icing recipe on the shelf just waiting for a reason to try it out—-it pairs great with the cake and has a light, creamy texture that is less sugary and heavy than traditional cream cheese icing. So next time you crave a classic carrot cake, give this recipe a go. It’s a classic amped up a notch, both in presentation and flavor.